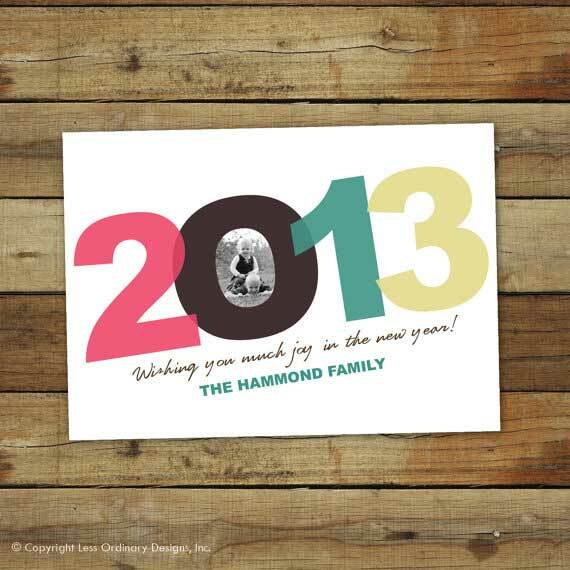 Wish your friends and loved ones a Happy New Year with these Festive New Year Cards! 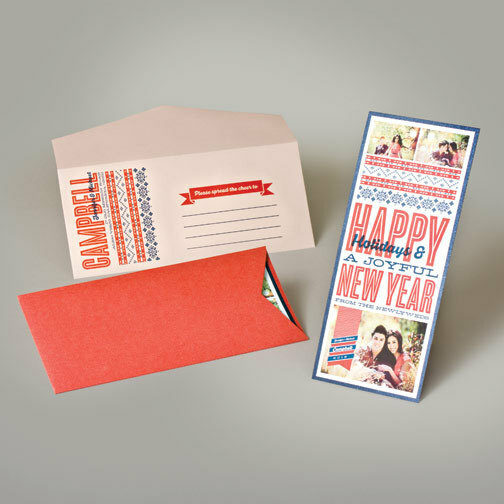 New Year / Holiday Cards are a popular and affordable way to send something personalized and a lot special to your family and friends. 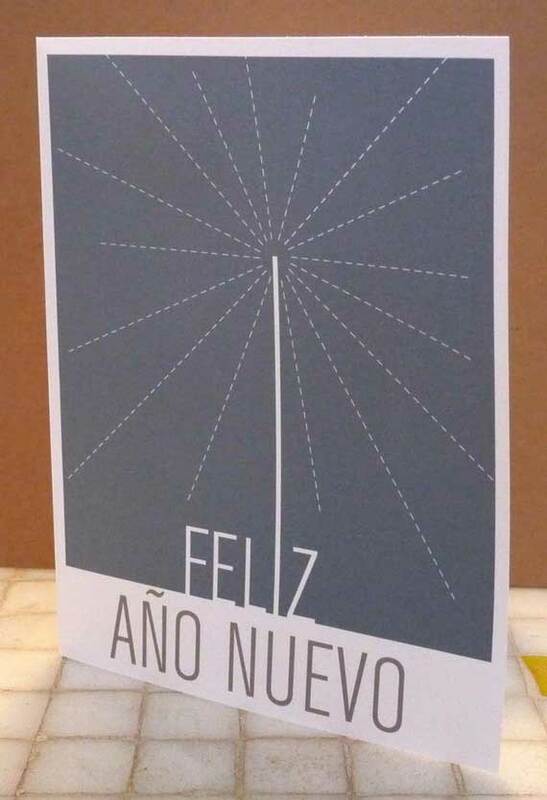 So today, we’d like to show you a series of New Year Cards/ Holiday Cards, probably the best of what we’ve seen so far. 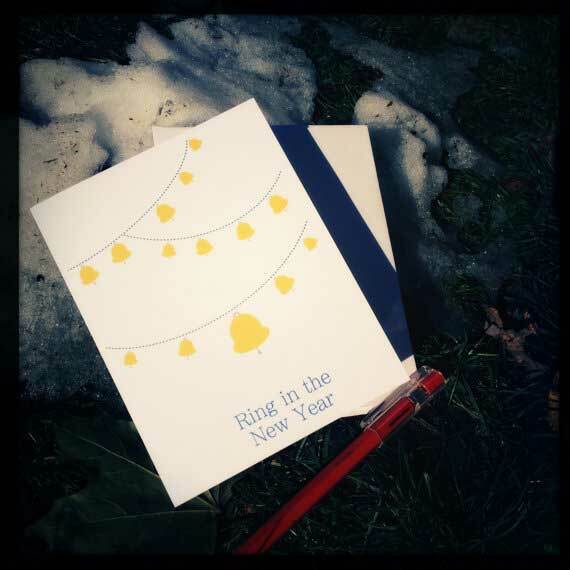 Let's Ring in the New Year with these creative New Year Cards! 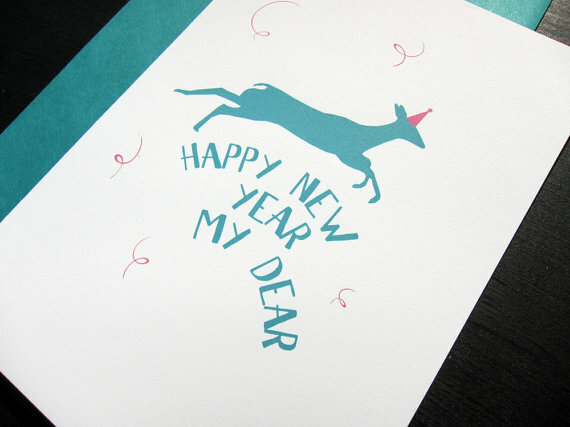 Here’s a showcase of 50 Creative New Year Card Designs. 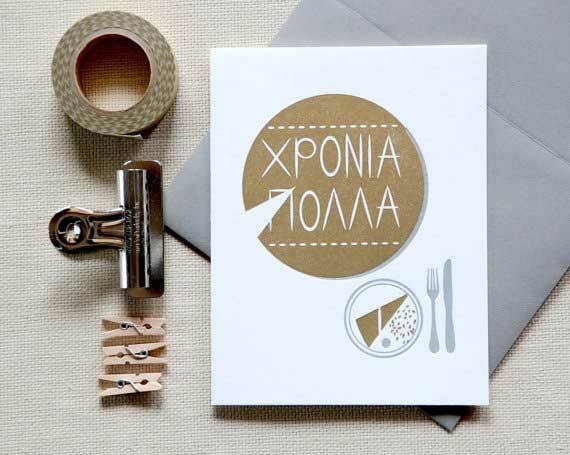 Send your holiday wishes with these cards, inspired by the New Year's bread that is baked in every home in Greece. The one who finds the silver coin in their piece has luck for the whole year - maybe you will too! 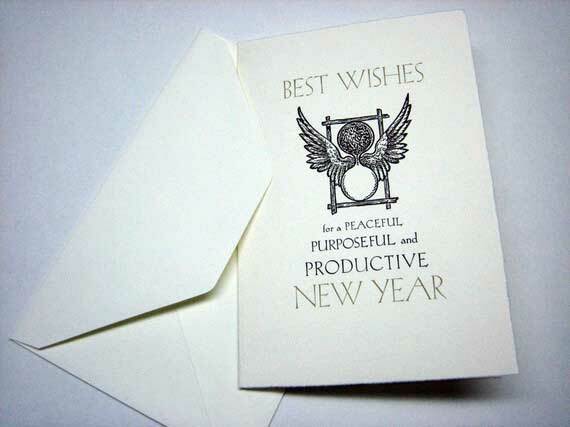 Letterpress printed A2 (5.5" x 4.25") folded greeting card. Hand-fed and printed on a Golding & Co. Pearl press. Happy New Year! 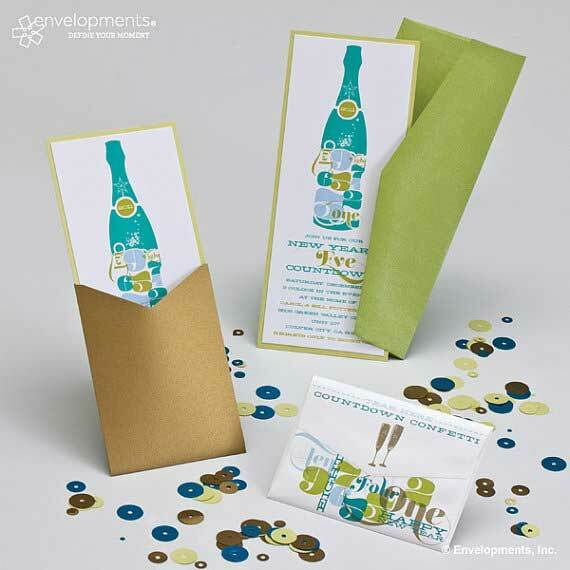 Celebrate the New Year and invite your friends with this elegant invitation. 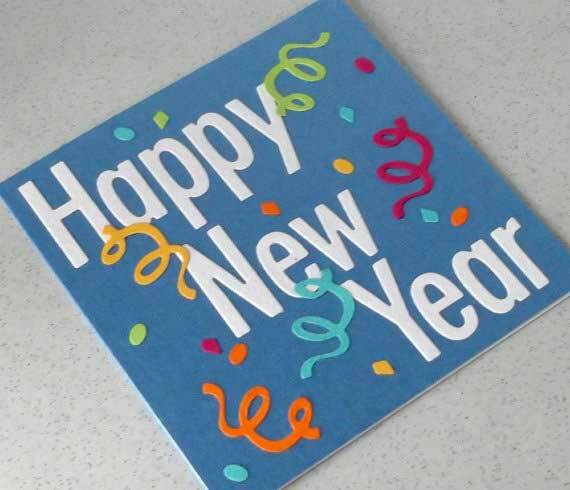 12 4x6 cards are printed on – 80 pound, recycled, smooth white cover with matching envelopes. 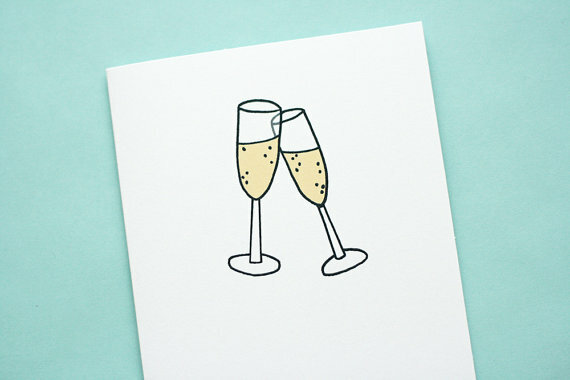 All greeting cards are letterpress printed on 100% recycled paper. I know some people make plans to lose weight or eat healthier. Me? 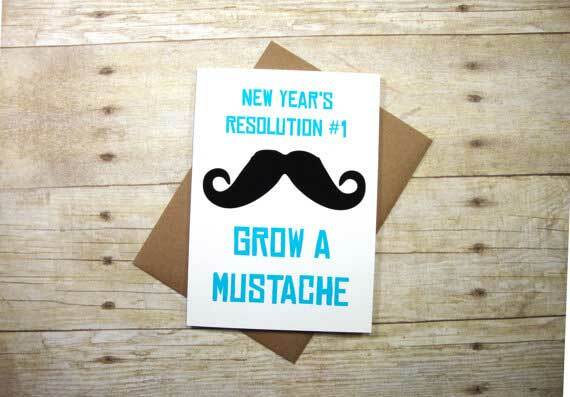 I just want to grow a mustache. 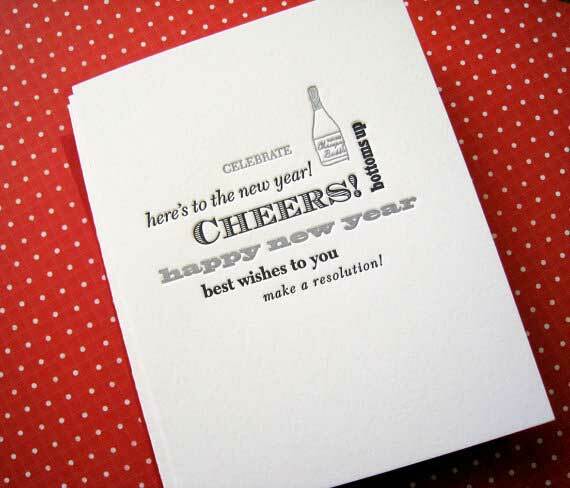 New Years Resolution holiday greeting card for those who want a realistic new years goal. All cards are printed on 80 lb, 12 mil matte photo paper. 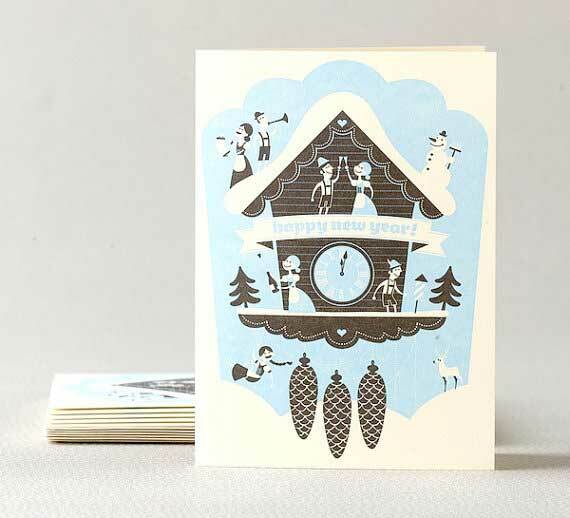 Each card measures 5X7 and comes with a kraft paper envelope. Exterior Reads: "New Year's Resoultions #1 Grow a Mustache"
Interior Reads: "Happy New Year"
New years is good for one thing, getting drunk. 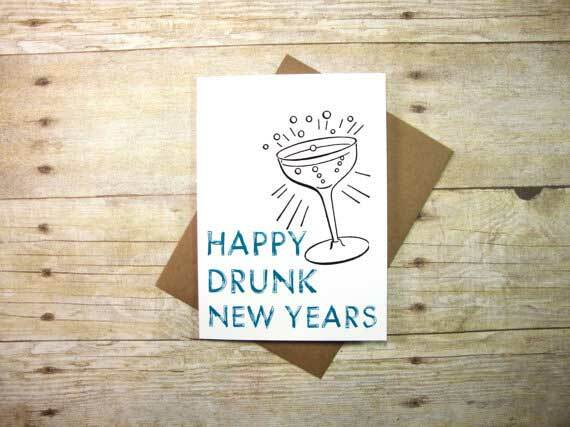 Perfect new years holiday greeting card for your alcoholic friends. 2013 will be a big celebration if the Mayans are wrong, what better way to celebrate then getting silly? 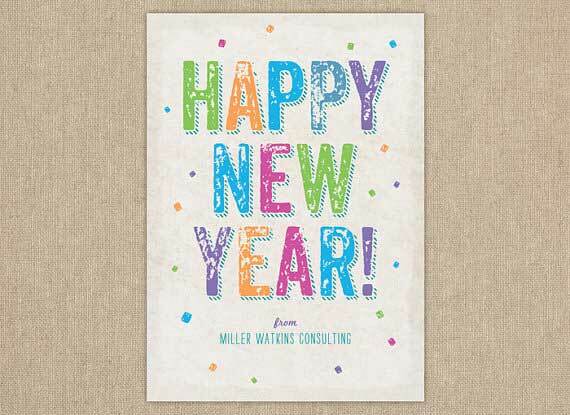 New & Improved Year Card: We are consumers, always looking for the next thing to make our lives better. this card plays off our consumerism & is inspired by vintage soap & detergent packaging. Say Happy New Year with this vintage popping bottle of champagne!! Printed on my Gocco PG11 with black and metallic gold inks. This card comes with a coordinating peacock blue envelope and a cellophane sleeve. A2 size (4.25" x 5.5") folded Soft white note card and envelope. All cards are blank inside. 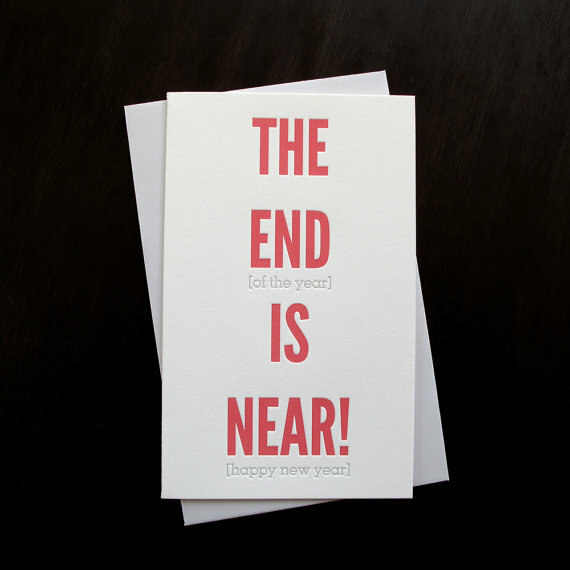 All of greeting cards are letterpress printed on 100% recycled paper. 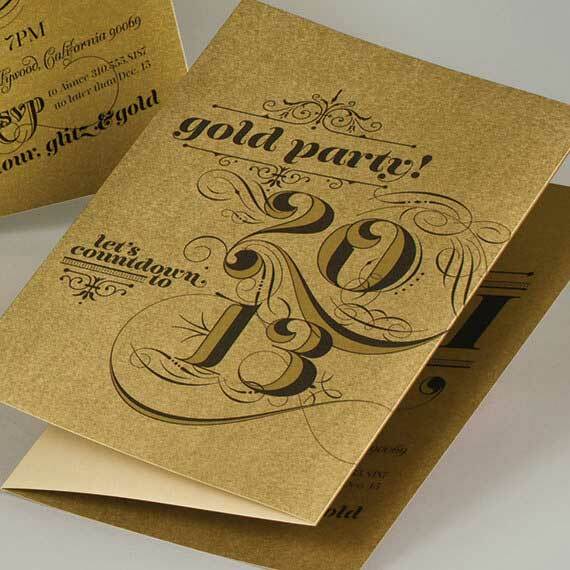 Surles New Year’s Eve Party Invitation: When you want your holiday party to raise the gold standard, try inviting your guests with this gorgeous ensemble. Envelopments 5x7 Landscape Z-Card in a duplex stock that is Bullion on one side and Ginger on the other with our always dynamic shimmery White Micah envelope. Let the countdown begin. 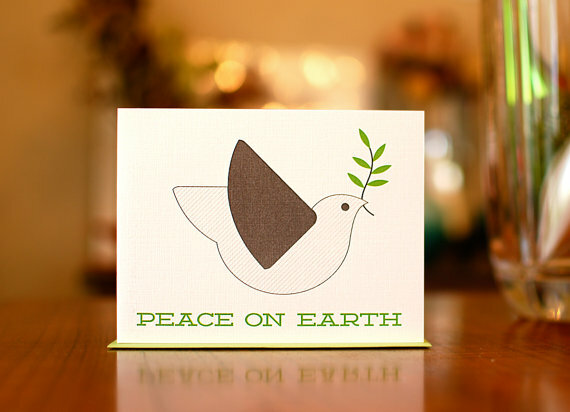 Be green this holiday season by sending this recycled "Peace On Earth" card. 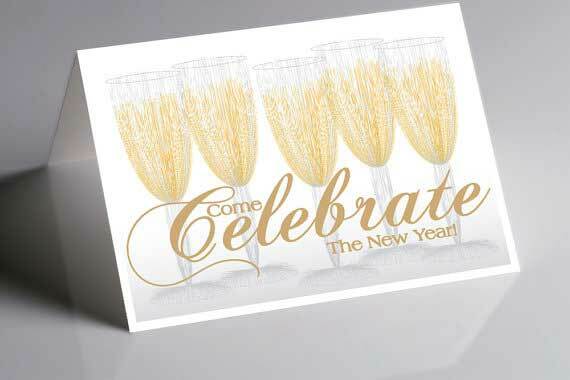 This note card features a pair of champagne glasses toasting - great for a New Year's celebration, congratulations, or any special event. 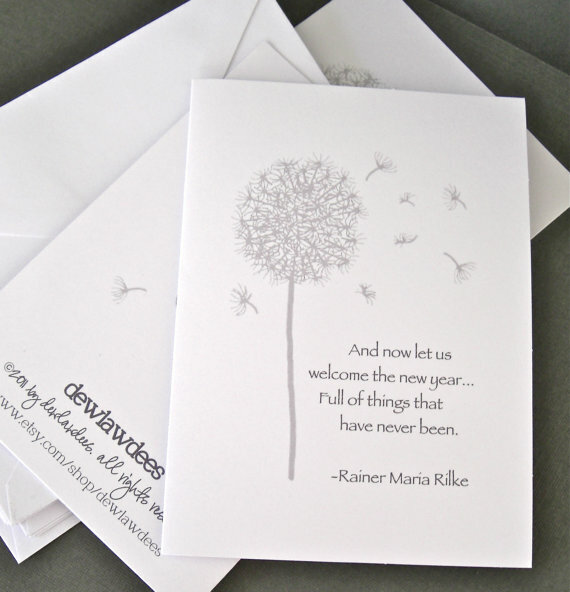 This card is printed with an inkjet printer on a bright white cardstock note card with a white envelope. The glasses started out as a pencil sketch which was then outlined in sharpie marker, scanned, and then digitally colored. 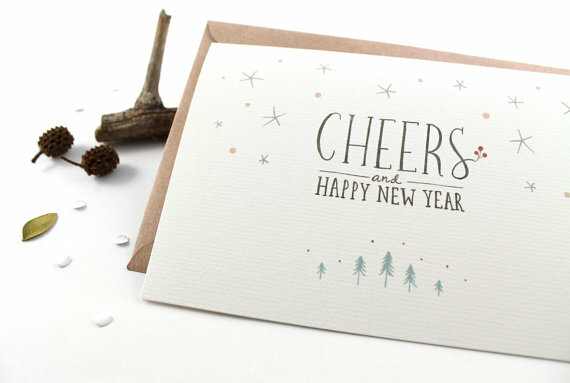 10 folded creamy white and slightly textured cards printed with my brand new 2012 holiday design. The cards are a standard A2 size and measure 4.25" X 5.5" with Peace, Love & Happiness lovingly hand screen printed with my Print Gocco in soft brown, shimmery turquoise and pomegranate orange ink. This unique invitation can be personalized with your favorite photo as well as a holiday cheer message to your family and friend. Sweet Charleston single house design is the perfect "home sweet home" sentiment for a happy holidays card. 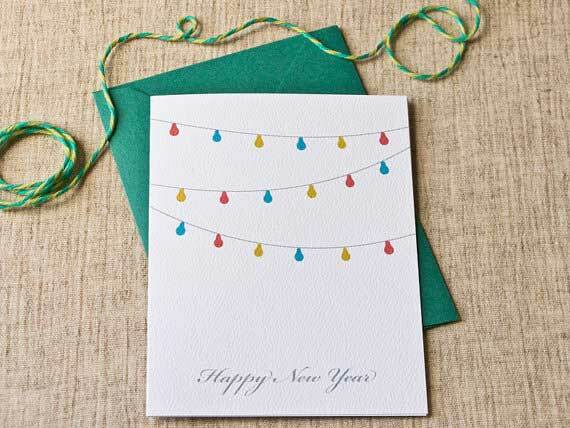 Pretty hanging Scandinavian style ornaments adorn this modern recycled Holiday Card, inspired by paper lanterns. Perfect for Christmas! 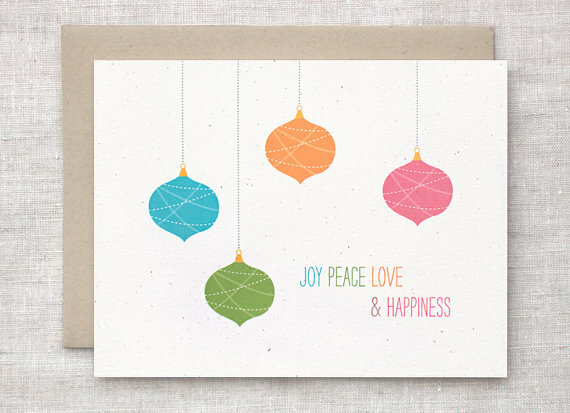 This holiday card design has four ornaments in teal, moss green, amber and dark coral with the words Joy, Peace, Love & Happiness in coordinating colors with brown, gray and yellow accents. Ornaments hang from the fold and were inspired by paper lanterns. They have stitched and diamond patterned lines loosely wrapped around each one in white. 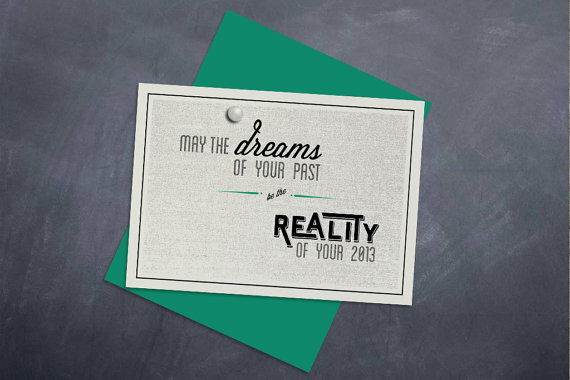 Card can also be placed in a picture frame to display good wishes during the season, printed on beautiful textured and speckled recycled cardstock. "May you Sparkle and Shine in the New Year." Calligraphy by Sarah Parrott, head designer/printer behind parrott design studio. Foil stamped in matte gold and letterpress printed in fuschia pink ink paired with a mint green envelope. Card printed on craft, sewed with golden yarn. You can pull out the card inside and write your wish on it. Put it back in and sent the card to who you love. Health, Wealth & Happiness! 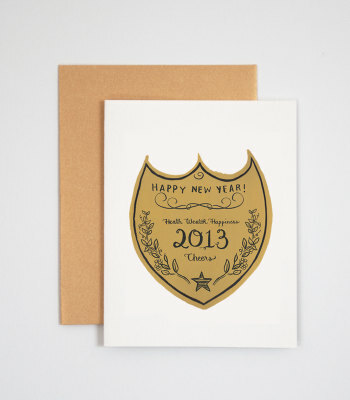 Spread your New Years well-wishes with this greeting card featuring an illustration of the quintessential champagne label. This card comes with a gold metallic envelope. Cheers! 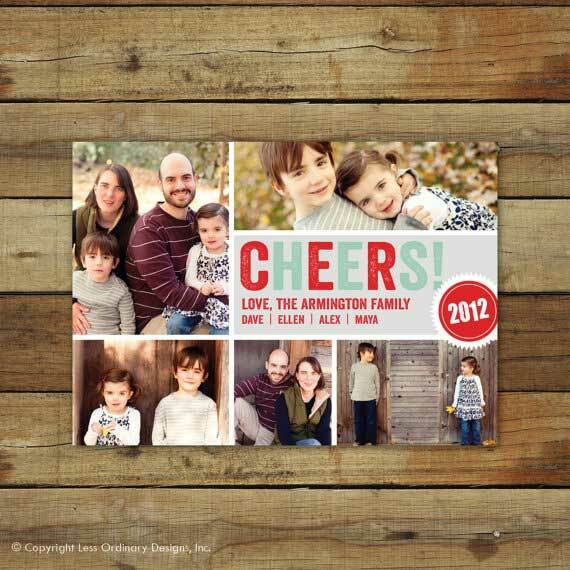 No time (or money) for fancy holiday cards? 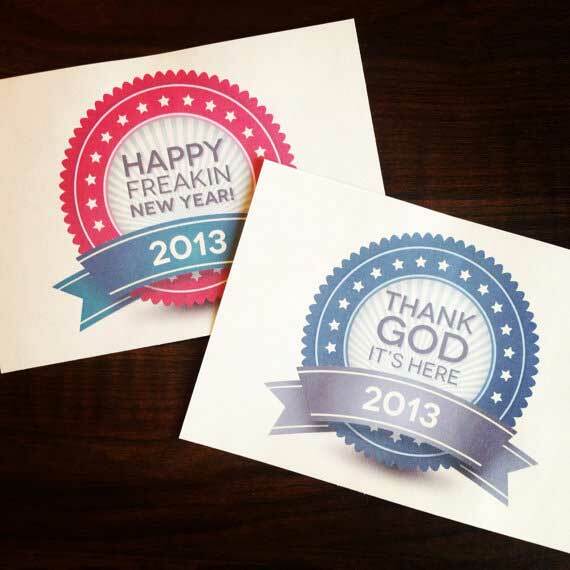 Drop these whimsical post cards in the mail on New Years Day! A2 size printed on 140# 100% PCW cover and paired with a recycled kraft envelope. Packaged in a biodegradable sleeve. 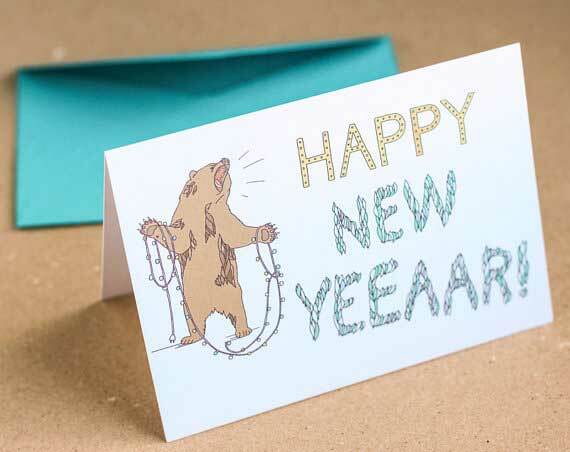 New Year's Garland Bear folded card with envelope. The card is blank inside. 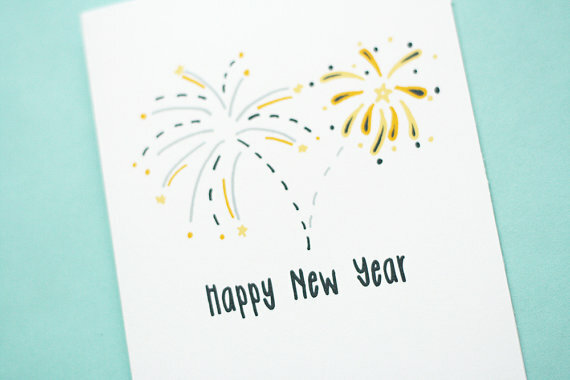 This note card features yellow and grey fireworks and the text 'Happy New Year.' The card is blank inside and comes with an envelope. This unique invitation can be personalized with your favorite photo as well as a holiday cheer message to your family and friends. Cheers and Happy New Year! 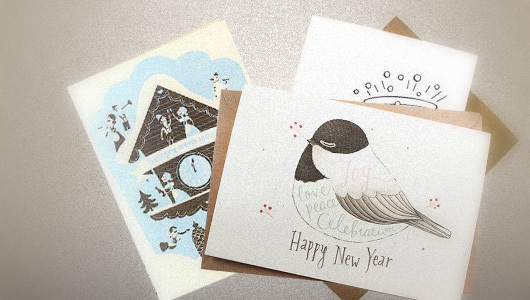 A set of 5 greeting cards printed from Yee Von's hand lettering and pen drawn illustration. May the gift of joy, love, peace, and celebration be yours as you make a new start! 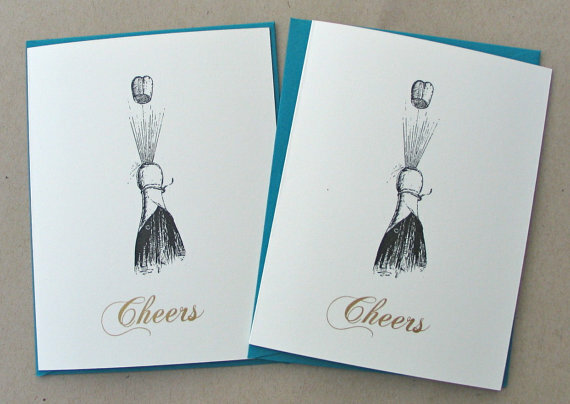 A set of greeting cards printed from Yee Von's hand lettering and pen drawn illustration. 2013 holiday greetings eco-friendly folded card printed on heavyweight 100% recycled brown kraft card. 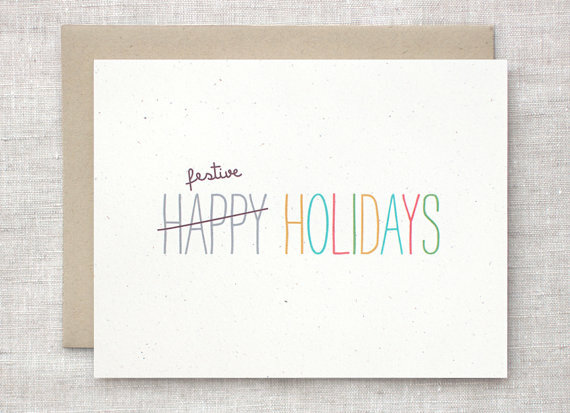 Send your holiday greetings with an eco message this year. Inside is left blank for your message. The card comes with a brown kraft envelope (also 100% recycled paper). An optimistic New Year's greeting wishing the ones you love all the best in the coming year. This card features a graphic designed of bells on a blue string. Across the bottom it reads: Ring in the New Year. The inside is blank. It's printed on linen card stock and measures about 4.25 x 5.5 when folded and comes with a matching envelope. These holiday cards are letterpress printed using hand-mixed crimson and silver inks on 100% cotton (tree free!) stock. The set comes with seven cloud envelopes and is packaged in a clear cello bag. What's New Year's Eve without some "estrellitas" (sparklers)?. 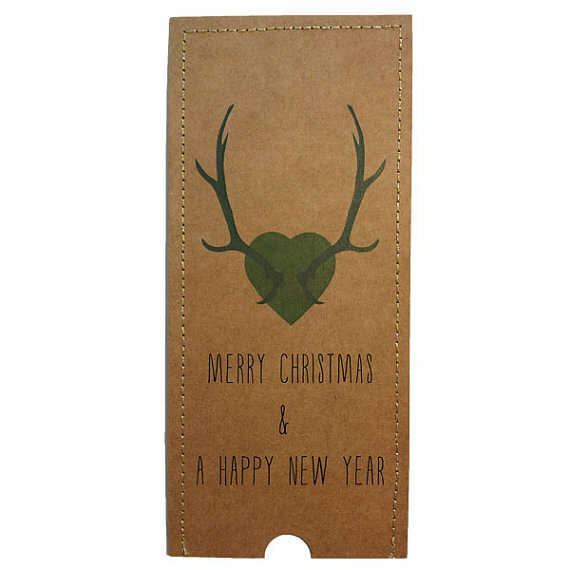 The card measures 4.25x5.5 inches and includes a craft brown envelope with a triangle flap. 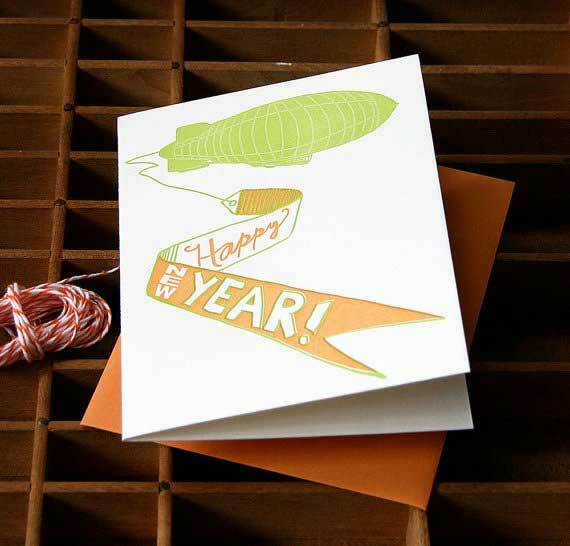 Happy New Year trailing from a big green zeppelin: This listing is for a boxed set of 8 new year cards. 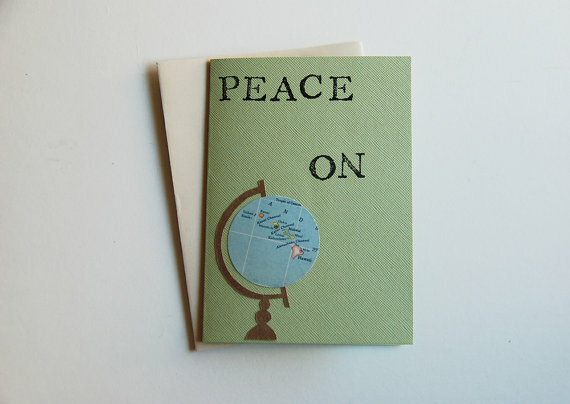 Each card (folded) measures 4.25"x5.5" and is letterpress printed in green and orange ink on 100% cotton paper. 8 orange A2 envelopes included. The 8 cards are packaged in a letterpress printed kraft box. Handset in various sizes of the extremely rare Koch Antiqua (aka Eve) and printed letterpress in two colors on Fabriano Medioevalis cards. When the press run was complete, the type was distributed. This edition is strictly limited to 100 cards. 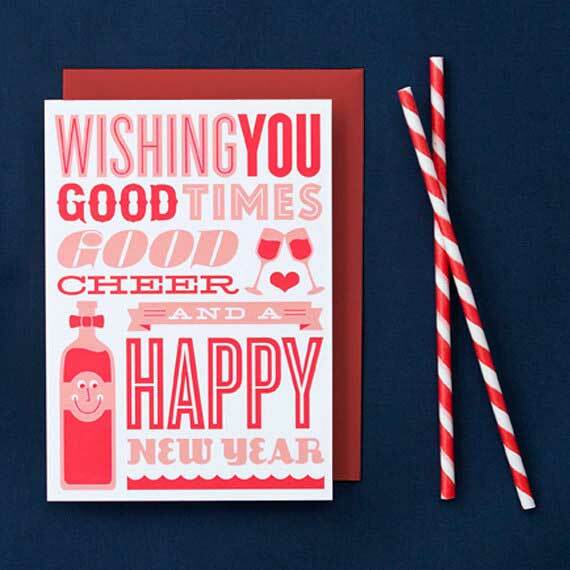 This is a listing for a set of letterpressed holiday/new year's cards in red & pink with matching red envelopes. Printed on off-white, 100% recycled French paper. 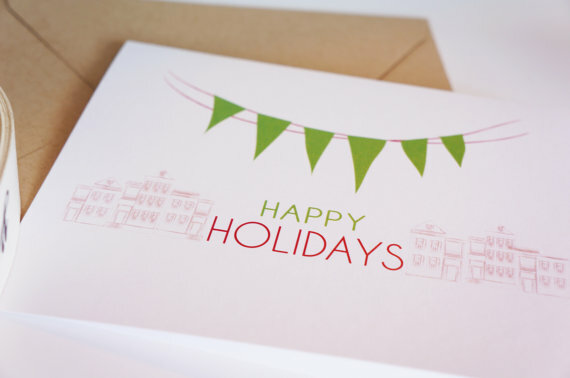 This set of bright and cheery holiday cards will bring a smile to any friend's face! 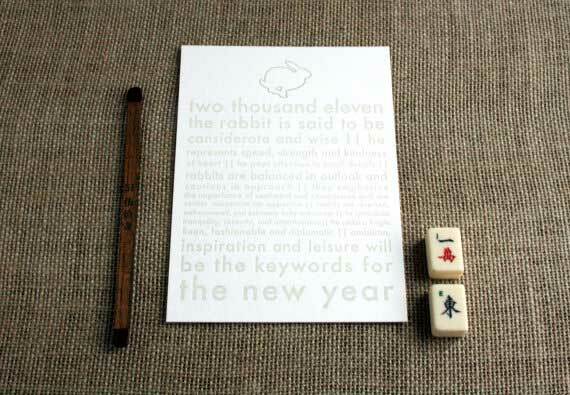 Each card was printed by hand on a vintage platen letterpress. 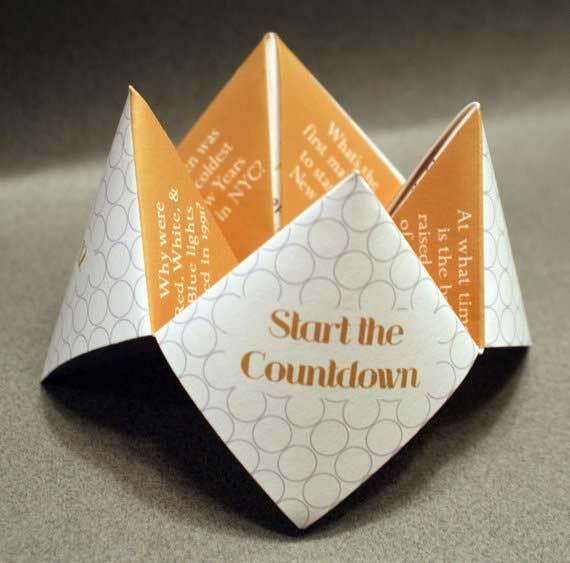 Cootie Catchers make for a great favor, invitation / card, or as decoration at your New Years Eve party! These funny little cards have been entertaining my friends and family and even business acquaintances for years. I began them back in 1980 when my first daughter was born and have done one every year since. They tell what the family is up to by what they're doing or wearing and of course all the pets are included. I have designed cards like these for other families in recent years and would love to design one for you. All I need are some reasonable photos of your gang, including pets and a bit of pertinent info such as is dad a sports fan? Is junior a budding chef? Is your daughter a hockey player? And what about mom? Is she a swim coach, a super sewer or a hot rod driver? 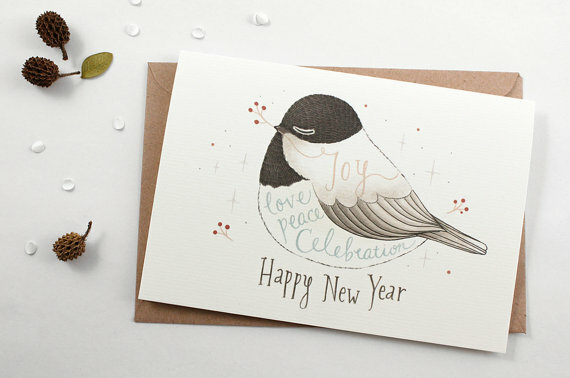 Ring in the New Year with these elegant, modern "Peace on Earth" cards. The front features a minimalist illustration of a white and grey patterned peace dove with a stylized olive branch in its beak. The design wraps around to the back of the card, where you see a close-up of the dove. 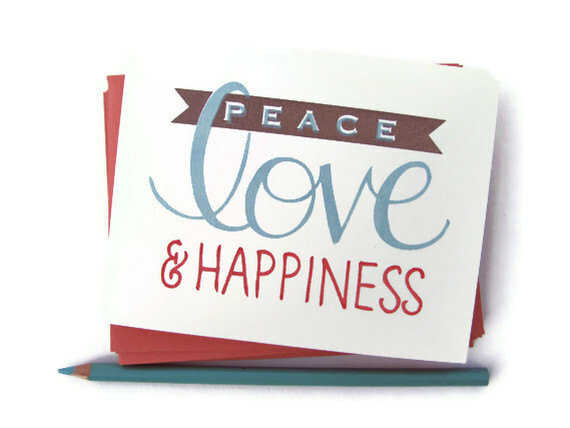 These cards are a simple and lovely way to send non-religious season's greetings to the people you love. Or the people you fight with. Either way! 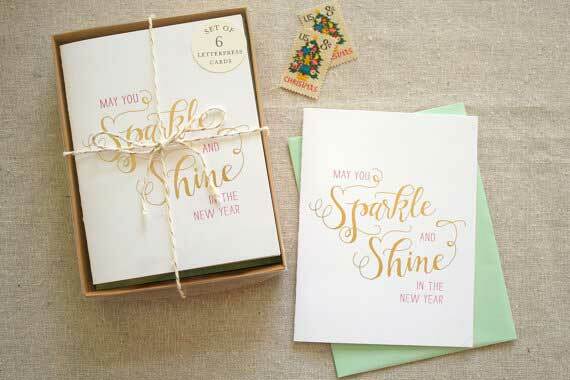 Send someone special a holiday greeting with this festive, sparkly New Year card! "and now we welcome the new year full of things that have never been"
Wish your friends and loved ones a Happy New Year with this festive card! 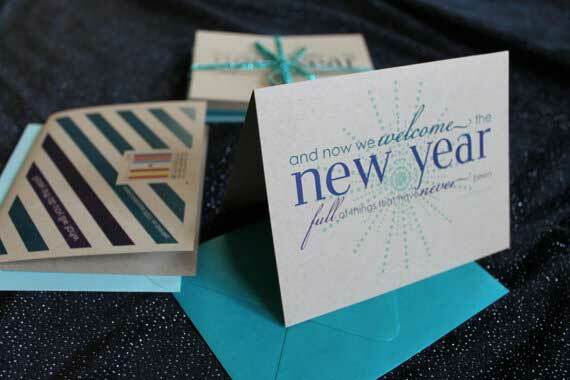 Single card printed on 100% post-consumer recycled paper paired with a 30% post-consumer recycled teal envelope. 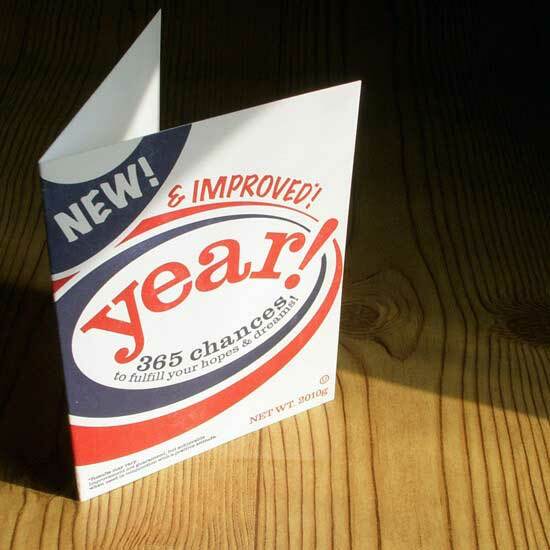 Folded size measures 4.25" x 5.5"
"what will you do this year?" 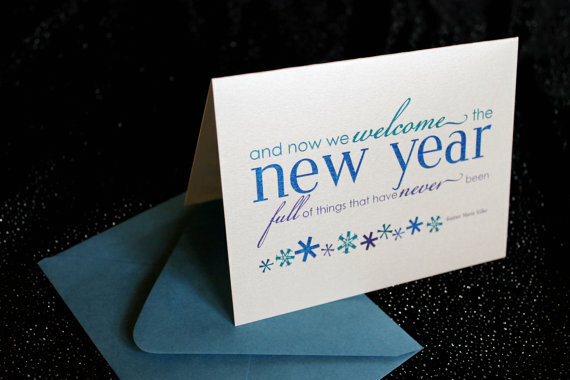 A simple but colorful type design in a distressed face delivers exuberant wishes for a happy new year. 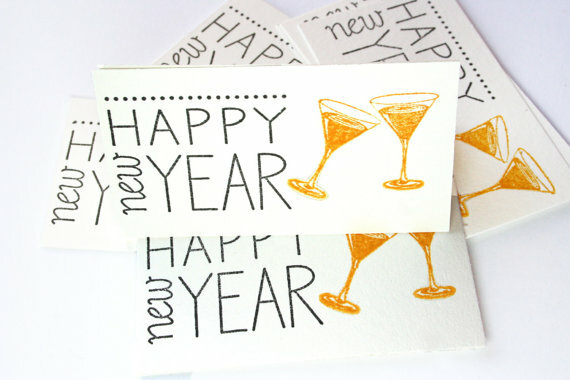 This listing is for a DIY printable 5" x 7" New Year's card for you to print at home or print through a professional printer. 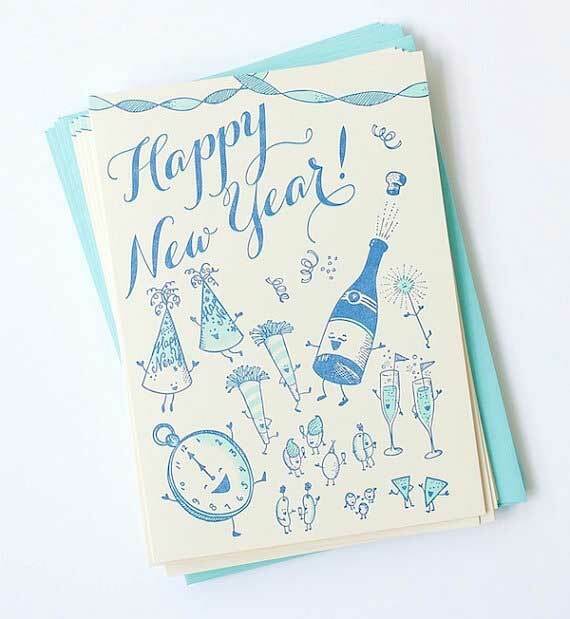 Handmade Happy New Year card: A bright and modern Happy New Year card with die cut letters and decoration mounted on a pearlescent blue background. 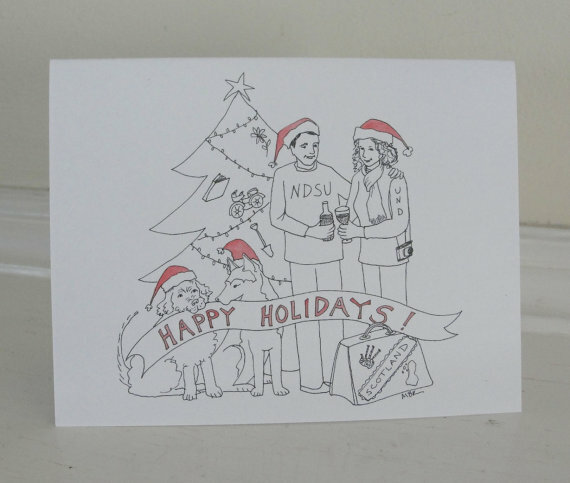 An original, distinctive handmade greetings card to celebrate the holiday season. Here are 6 tags that I cut and stamped by hand. Happy New Year with 2 clinking glasses. 2"x3-1/2". 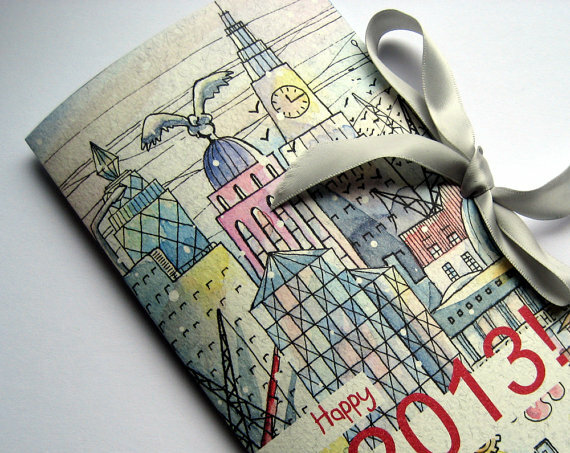 2013 whimsical London wall calendar inside a Happy New Year card: This calendar is designed as a decorative banner/concertina featuring beautiful London inspired illustrations. It comes folded into a 10.5 x 20 cm (4 x 8 in) booklet and unfolds into a colourful 20 x 84 cm (8 x 33 in) print. 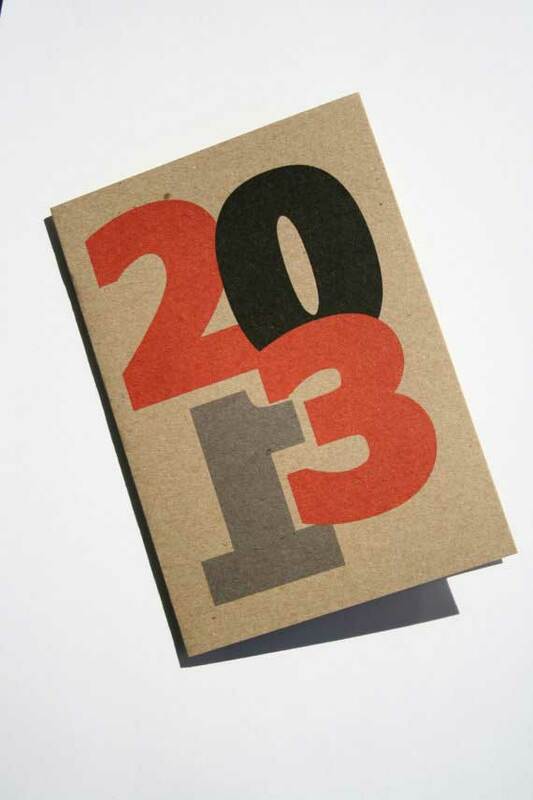 The calendar is included in a happy-2013-greeting card and attached to it with a beautiful ribbon. The ribbon can be used to hang the calendar on the wall. Ideal for kids bedroom decor or anywhere that needs cheerful decoration. A set of 10 cute and funny typographic & festive Holiday cards on high quality natural speckled and textured recycled cardstock. Great way to spread holiday cheer, for Christmas, and New Year! 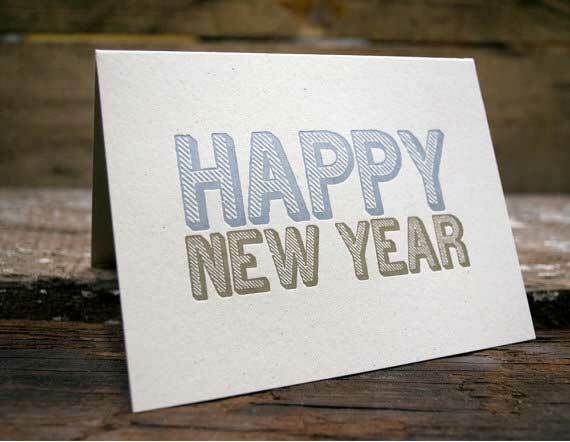 Thanks for sharing my Princess Pearl Paperie New Year card!